My week started with submissions pouring in for Presto Pasta Nights 239 – and while I left them simmering in the inbox, I attended to sorting out who gets whom for Secret Santa. Once I had given that task my full attention, I started reading all the wonderful recipes for this week’s Presto Pasta Nights. I hope you will click on each blog name to be taken to the dishes submitted. First up is Heather of girlichef’s Vermicelli Soup w/ Butter, Lemon, & Mint. This is a simply perfect dish for any moment, not just mid afternoon while watching Iron Chef. Kirsten of From Kirsten’s Kitchen To Yours has a lovely dish of kale and slow roasted tomato fusilli, which works well for my Tandy Tuesday challenge of a pasta dish using 5 ingredients or less. Ruth of Once Upon A Feast has shared with us One The Mend Quick Fettuccine Bolognese. I would not need to be sick to have an excuse to enjoy this meal! Elizabeth of lawstudentscookbook submitted beef tetrazzini which is an adaption of another recipe she had and used up some of her left overs. Val of More Than Burnt Toast has shared Sheet Macaroni and Cheese – an inspired dish. It has my favourite crunchy topping, and is going on to my bucket list! Helen of Fuss Free Flavours is making sure we have something great to do with our Christmas left overs with this dish of chestnut, cranberry, stilton & sprout pasta. I might not be able to wait! Alisha of Cook. Craft. Enjoy. has submitted a recipe for pierogie casserole. This is definitely something new and different for me. Caffettiera from la caffettiera rosa cooked linguine with mussels.This little feast does not take long to prepare. Jac of Tinned Tomatoes (who I will hopefully meet next year) has submitted this ‘creamy bowl of heaven’ as Ruth describes it. Her tagliatelle con Spinaci e Funghi is a dish to be enjoyed when you need a cheese hit. Last, but in no means least is Shelby aka HoneyB of The Life and Loves of Grumpy’s Honeybunch has introduced me to a new ingredient with her capativi with wild mushroom sauce. I also now have another use for my sage plant. 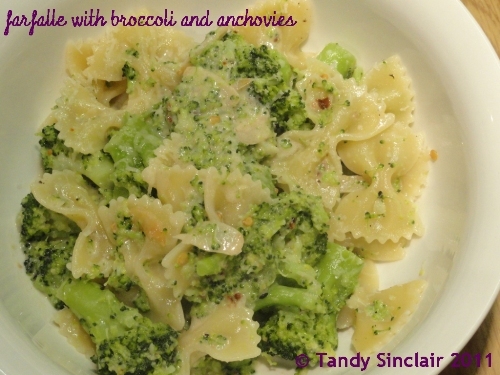 If you missed my post earlier during the week, I made pasta with broccoli and anchovies. Thank you Ruth so much for letting me host! I love this round up. Lemon and mint, just perfect. So many great ideas. Hi Tandy, they all look delicious! who needs night time…might have to go pasta for lunch today, all entries are looking great! Pasta any time is good! What a choice…so many recipes, so little time. It’s hard to decide which to try first, maybe spinach and mushrooms will talk to me. Wow all of these are making me extremely hungry!! What a round up, and as Ruth said so much intro for each dish! I always leavev my round ups to the last moment and then have no time left. So many wonderful recipes to choose from, where does a pasta loving girl begin! Wow Tandy, what an incredible line up of PPN! Great line up of pasta dishes!! Each one had me taking note to try! I do try to limit my carbs, but I also allow myself some pasta! Thanks for pulling this together! 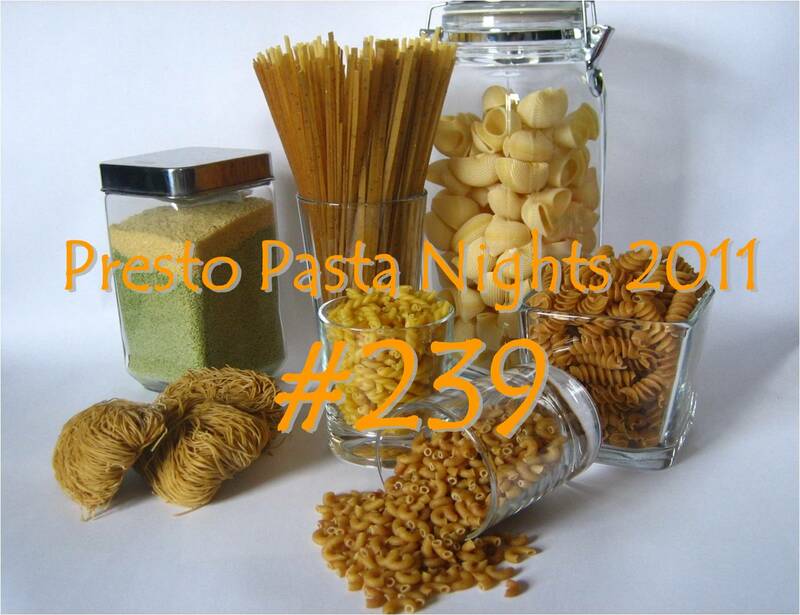 What a super delicious Presto Pasta Night Roundup! Thanks for the great hosting job. You gave each dish a fantastic intro. Now all we have to do is eat!